Cheryl Magness tells us how the recently departed author Elie Wiesel’s message will continue to resonate. As Americans we are taught, and most of us believe, that there is something special about America. We speak reverently of the independent and pioneering spirit that sparked a new nation “conceived in liberty and dedicated to the proposition that all men are created equal.” We cherish the “rugged individualism” that enabled us to build a “shining city on a hill.” We think of ourselves as being the most generous and compassionate people on the face of the earth. This view of ourselves as something unique in history, a nation markedly different from, and superior to, any other, has the potential both to motivate us for good and to lead us into laziness and neglect. For it is in believing too fully in our pedestal that we have the greatest capacity to fall off of it. In London in 2015, an old man who has been a fugitive for many years is murdered. In Glasgow, Jack Mackay, a retiree, is summoned by his old friend Maurie, who is dying of cancer. Maurie makes a request, or more of a demand. The murdered man did not do the crime everyone thinks he did. For that reason, Jack must get the old band together, and they must take Maurie to London before he dies. That’s the premise of Runaway, by Peter May. It’s a crazy request, but Jack is at loose ends in his life and has nothing better to do. Also, he’s curious. Fifty years ago, the friends were in a rock band, and they all ran off on impulse, to find fame and riches in London. What happened was traumatic, and left Jack with many unresolved questions that still haunt him. Soon the old men are on the road, in a “borrowed” car, with Jack’s couch potato grandson dragooned into driving. As they follow the route they traveled half a century earlier, the reader follows Jack’s recollections of the original journey, the central event and great tragedy of all their lives. I was uncomfortable with this book at first. I feared it would be yet another celebration of the glories of the Love Generation, with its supposed idealism and courage. But what the band encounters in this story is much closer to the actual truth – passions running riot, drugged confusion, and cynical predation by exploiters. Jack is victimized, and victimizes others himself, to his eternal regret. It’s a sad story, but insightful, and – in the view of this survivor of the era – pretty authentic. I also ought to mention that on one particular social issue – I won’t spoil it for you – it takes exactly the right side. This wasn’t an easy novel for me to read, but in the end I found it rewarding and enriching. Cautions for language, sexual situations, and disturbing content. I picked up this book with great anticipation. 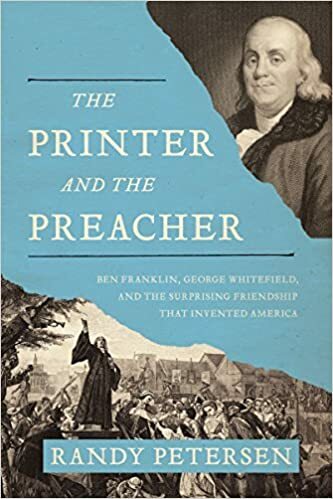 It’s fairly well known that Benjamin Franklin and the English revivalist George Whitefield were friends. An account of their friendship promised a very entertaining and educational story. Unfortunately, though it was educational, the entertainment element was largely wanting in The Printer and the Preacher. Author Randy Petersen clearly did a lot of research to produce this book on two remarkable men. George Whitefield to a large degree invented popular evangelism as we know it – emotional, dramatic preaching, avoiding denominational distinctives for a “mere Christianity” gospel. Benjamin Franklin, as his major publisher, supported his work (most of the time) because of its positive social effects, but could never accept the deity of Christ. Nevertheless the two men liked and respected each other, and were friends for many years, until Whitefield’s death. Whitefield again and again urged Franklin to consider Christ’s claims, and Franklin politely put him off. Wouldn’t it be intriguing to have been a fly on the wall during one of these men’s meetings, when the very concepts of what would become American religion were being worked out by two men of intelligence and wit? Alas, The Printer and the Preacher never provides any detail of such a meeting, even in summary. Apparently such accounts don’t exist, and the two men’s letters don’t preserve the kind of interchange we’d like to have. What we get, instead, is bits of factual information scattered like raisins in the great oatmeal bowl of the author’s analysis. Don’t get me wrong – the analysis is good, as far as I can tell. But I wish the author had trusted his story more, and felt less obligated to explain each point to us. Of course that would have left us with a much shorter book. The Printer and the Preacher is a useful work. But it’s not a great pleasure to read. Bob’s church is closing. That, I think, is the central metaphor of The Drop, a masterful novel by Dennis Lehane. Bob loves his church, and goes to mass every day. But he never communes, because he refuses to make confession. He loves the old church’s traditional beauty. He finds a kind of peace there. But the Boston diocese can no longer support it, due to legal obligations to victims of priestly abuse. Bob is a nice guy. People like him. But he’s lonely. Women don’t find him attractive. His only real friend is his boss, his cousin Marv. He and Marv set out to be gangsters once, years back, trying to be tough. But then the Chechen mob moved in, showing them what tough really meant. They took over Marv’s bar, and Marv and Bob sank back, almost with relief, into semi-respectability. Except that the bar is now a “drop,” where from time to time gambling money is collected for pick-up by the mob’s messengers. Then one night, Bob hears a noise from a garbage can. He opens it to find a puppy there, bloodied and abandoned. A girl watches him rescue the animal, and in one night Bob acquires both a pet and a (sort of) girlfriend. Bob doesn’t know it, but people are making plans, intending to use him as a pawn. They are making a big mistake. 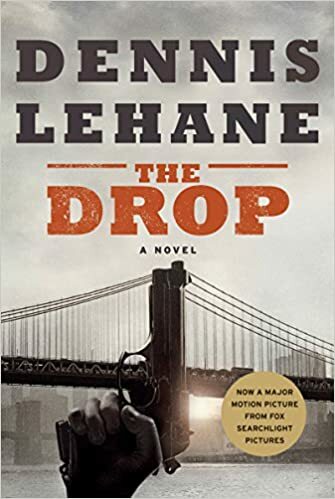 This is one of Lehane’s best novels, in my opinion, which is saying a lot. Not only does he ratchet up the tension mercilessly, but he plots with elegance. I wasn’t prepared at all for the conclusion. Christianity plays a major role in The Drop. I don’t think Lehane is advancing any kind of apology for Christianity, but he asks the right questions, and poses the big problem (in my view) entirely correctly. Highly recommended. Not for kids, or those easily shocked. Patrick Henry’s famous speech, as performed by my close personal (Facebook) friend, James Patrick Riley of Courage, New Hampshire. A warm sun slanted out of the autumn sky, transforming every tree into one of nature’s stained-glass windows. The golds and yellows, oranges and reds of the fall leaves glowed vibrant and luminous, backlit by the angled rays of the sun, turning the forest into a cathedral of color. Sime had forgotten just how stunning these autumn colors could be, his senses dulled by years of gray city living. 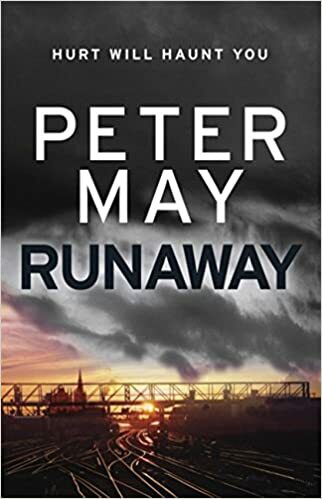 Another novel by Peter May. Another home run, in my opinion. This guy can write. As Entry Island begins, a man has been stabbed to death on Entry Island, in the Madeline Islands on the Gulf of St. Lawrence in Canada. Detective Sime Mackenzie is sent to act as translator for the investigators. The province is francophone Quebec, but the people on Entry Island still speak English, which is also Sime’s (short for Simon’s) childhood tongue. He’s not eager to go – he’s exhausted, debilitated by chronic insomnia. And he doesn’t get along well with the other officers – especially the one he used to be married to. The murder victim was the richest man on the island, and suspicion centers on his wife, who says she was attacked by a knife-wielding man, and her husband died defending her. But the moment Sime meets Kersty Cowell, he has an irrational sense that he’s seen her before. Then she remarks on the signet ring he wears, an heirloom from his father. She has a pendant that matches it exactly, she says – though she can’t find it when she looks for it. As he pursues the investigation, Sime is tormented by brief, vivid dreams during his short periods of sleep. In these dreams he relives the experiences of an ancestor who bore his name, who was a victim of the 19th Century land clearances in the Scottish Isles (his grandmother read to him from the man’s journals). He loved, tragically, a woman also called Kersty. History, dreams, and police work come together in a drama that might save Sime, or drive him mad – or kill him. Once again, Peter May presents a fairly far-fetched plot, but closes the deal with style. His characters are good, his dialogue vivid, and his descriptions cinematic. As a Christian, I had trouble with suggestions of some kind of reincarnation, but the faith of the Christian characters is presented with sympathy and no axes are ground. Cautions for the sort of things you’d expect. 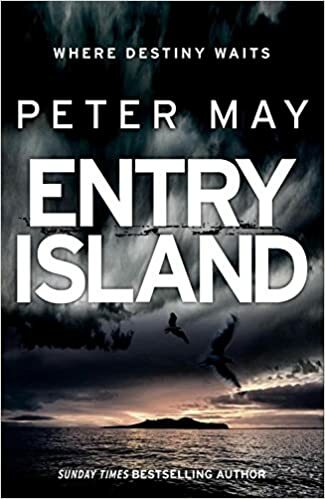 Sometimes heartbreaking, sometimes transcendent, Entry Island is a superior reading experience for mystery fans. I’m becoming a fan of Scottish writer Peter May. 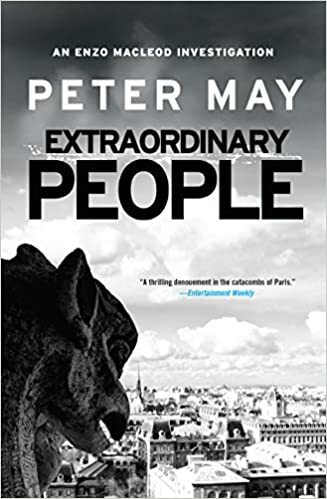 Extraordinary People, which seems to be the first book of a new series, only added to my enthusiasm. Enzo MacLeod (half Italian, half Scottish) is the father of two daughters. One, whose mother died, adores him and lives in France. The other, whose mother he divorced, will not speak to him. However, she too lives in France. Enzo used to be a forensic scientist for the police, but now he teaches biology at the University of Toulouse. As a sort of a lark, he makes a bet with a friend, a journalist who’s writing a book on unsolved disappearances. Enzo bets him that he can solve the disappearance of a famous professor, public intellectual, and film critic about ten years before. Quickly he is able to identify a skull discovered in a metal case in the catacombs of Paris as that of the missing man. Along with the skull various items were found, and Enzo believes they are clues to the motive and murderer. He begins to run the clues down, using the resources of the internet, which did not exist when the man was murdered. Along the way he gradually learns that someone is following his investigation, someone willing to kill him and those he cares about to keep old secrets. The form of this mystery is one I don’t generally buy into – the serial puzzle mystery, where the detective has to solve a series of obscure riddles to solve the crime. Such things happen in real life, I think, never. In outline, this story resembles the National Treasure movies, which I found contrived and unconvincing. But May plays the game at a much higher level, and while I recognized the implausibility of the plot, I still had a good time following it. Enzo is an ambivalent character who can sometimes repel the reader, but his growth in maturity and self-knowledge is part of the story. Cautions for the usual stuff, plus a couple naive comments in the Dan Brown line. But overall I enjoyed Extraordinary People very much. 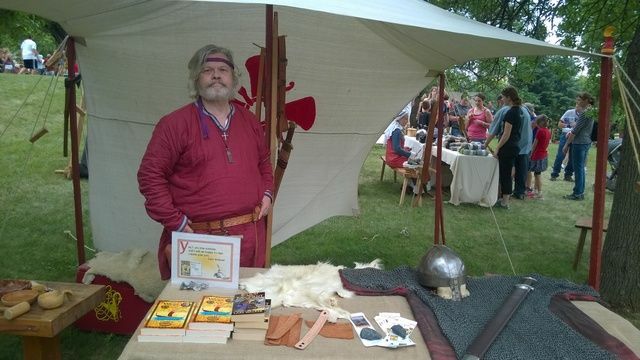 Our friend Roy Jacobsen, who used to run a fine writing blog called Writing, Clear and Simple, dropped in for a chat during the Viking festival on Saturday. He took the picture below. Past the canvas you can see, seated, my friend Kelsey, who sewed my tunic. Well, that was dumb. I just erased all the photos I took at the Midwest Viking Festival this weekend. I’ve been having increasing trouble getting the reader for the smart card in my camera to communicate with my computers, and in the course of grappling with it I managed to erase the card. There’s another picture I do have, of me sitting under my awning at the festival. But it was taken by a stranger who was kind enough to e-mail it to me, and I don’t feel right publishing her work in this space without her permission. I could e-mail her and ask, but I won’t be doing that tonight. I’m running behind in my chores. Maybe I’ll have it for you later. Anyway, I made the four hour trip to Moorhead for the festival at the Hjemkomst Interpretive Center. It was not without challenges. Moorhead has invested heavily in road repairs this summer, and has blocked two of its I-94 overpasses, while also blocking off several of the main streets. The festival put us up in a motel south of the highway, and the venue is some blocks north of the highway. I don’t think I traveled between the two points a single time without getting lost. I almost feel guilty writing this review. To an extent, it’s a minor exercise in vindictiveness. But I’m pretty sure I disliked the book before I figured out I didn’t care much for the author, either. So bear that in mind when evaluating my evaluation. 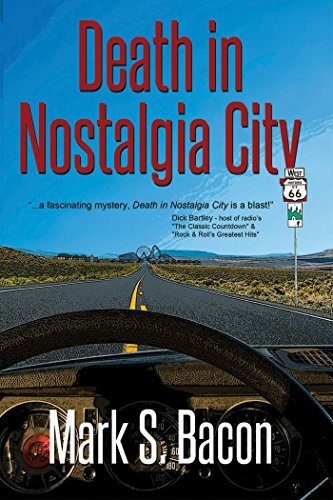 Death in Nostalgia City is the story of Lyle Deming, a burned-out former policeman who’s found a much more pleasant niche for himself. He drives a vintage taxi cab in Nostalgia City, a theme park in Arizona designed to recreate the Baby Boomers’ childhoods. So he’s reluctant to get involved when the park’s tycoon owner asks him to investigate a series of acts of sabotage in the park. The owner is in a precarious financial situation, and if these incidents impact the business, the evil insurance company that holds his notes may foreclose on it. I fear that the main reason I actually read this book through to the end was so I could honestly tell you how much it annoyed me. I found the writing… slack. Not awful (though it does include infelicitous sentences like, “’Let’s see who our guests are,’ Lyle said, nodding toward the wallet he’d extracted from the wounded man.’” Extracted? With a surgical instrument, perhaps? ), just not at all gripping. The dialogue has zero sparkle or wit. The characters are cardboard, and they all talk alike. The plot tension fails to ratchet up until the very end. And the villains are predictable (except for one surprise, which I’ll admit did fool me). As icing on the cake, progressive political opinions find their way into the story in a couple places. Which will play well with some audiences, of course. Anyway, I don’t recommend this book, but it doesn’t cost much, if you want to double-check my prejudiced verdict. When we change the Bible into a chapter and verse Bible, plus added all these other modern additives — cross references, section headings, footnotes, all the other stuff that we put in Bibles — we have really made it hard for people to just flat out read the Bible. And one of the things I contend in my book is we should be reading first and studying second and actually doing our study in the context of having read whole books, because that is really what authors intended. Their central unit is not a verse, is not a chapter, it is a book. Tony Reinke of Desiring God talks to Glenn Paauw, the Executive Director of the Biblica Institute for Bible Reading, on how the Bible came to be designed the way it is today. Paauw says practical considerations simply built on each other so that while we’ve done much to help people reference the Bible, we’ve also hindered them from simply reading it. Cynthia Ozick, who is now 88 (“piano keys,” as she sprightfully said when I [Giles Harvey] congratulated her on her recent birthday), has not ceased from the mental fight in the intervening years. She remains a crusader, a missionary or, as she recently put it to me, “a fanatic” in the cause of literature. With one hand she has written some of the strangest, most intellectually daring and morally intelligent fiction of recent times, including “The Shawl” (1989) and “The Puttermesser Papers” (1997); with the other she has produced a prose brick of lit crit, essay after essay on subjects ranging from the Book of Job and Gershom Scholem to Helen Keller and Susan Sontag. You could furnish a room with the prizes she has won, and yet the embrace of a wide readership and extraliterary fame has proved elusive; and no wonder. Public demand for the exacting insights of practitioner-critics, never high, has been in steady decline for a good while now.